Welcome to our webpage. 15 years ago I fell in love with a miniature dachshund. After having bred and shown Rottweilers for over 25 years, I found I could not longer run them around and do them justice in the ring. My husband Phil introduced me to these wonderful little dogs. 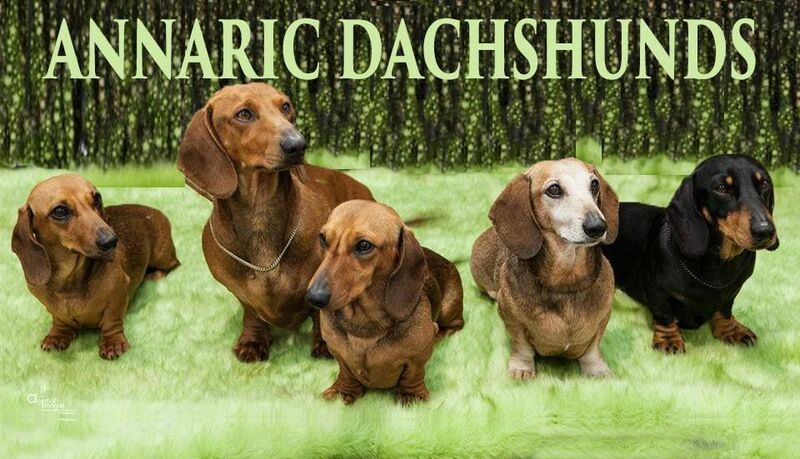 He had a miniature smooth dachshund and a whippet as a young boy and used to take them hunting. So when the opportunity came for us to be given a little black n tan girl called Spicegirl on breeders terms we jumped at the chance. Her pedigree name was "Myola Thyme N Tide" our Spicegirl, we fell in love with her and have been hooked ever since. 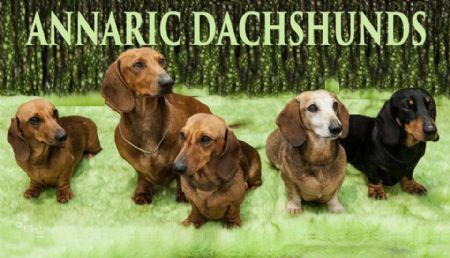 A dachshund just captures your heart and you have to have one or two in your life forever more. About 12 months after we got Spicegirl we had Quigley "Ch Vita Quigley" come to live with us he live to 13 years of age when we lost him. Our beautiful Standard Smooth boy - GRAND CH EUKYPARK KINGSTN HEATH & EUKYPARK MIDNITE IN PARIS - owners PJ & AJ Howie, JM Taylor & KF Morgan of Eukypark Kennels in Tasmania. "CH ANNARIC WEE WILLOW IN THE WIND" Willow. "AUST CH ANNARIC SCARLET MIST" Suzy mother of Willow has been sterilized and is now in her loving retirement home with her family in Tasmania. 2013 has been a very sad year with the loss of "Aust Ch Eukypark Do anything for Love jointly owned by Phil & I and Joyce Taylor and Kevin Morgan was killed by a tiger snake on 17th March, then Ch Annaric Clancy who was killed by a Dugite on 21st October & Annaric Wee Thorn in a red tie his grandson was killed 11 days later by another dugite on 5th November 2013. These 3 special dogs were very much loved and are missed terrible. RIP Poppy, Clancy & Dudley. ​Sadly our special little man "Clancy" Annaric The Wee Outlander named after our old boy Clancy was also killed by a snake on 10th December 2015 just 18 short of being 12 months old. So many of our beautiful dogs have been lost so tragically. Ann and Phil Howie of ANNARIC KENNELS thank you for browsing through our website and hope you enjoy taking a look at our dogs.